Refurbishing buses and coaches to give them a new lease of life is nothing new and having them repaired is all too familiar an experience. However, that does not mean the market for this work has stayed the same over the years. Chris Peat has contacted various companies skilled in rejuvenation to find out what the trends have been and what issues they are facing. It has been the case for a number of years and remain so, according to Martina Green at Duoflex, that many operators are now opting to keep coaches and buses for longer, refurbishing them rather than buying a new vehicle. One particularly common job for her company is up-seating, removing toilet units and adding extra seats. This is in addition to its specialisation of reupholstering seats, providing a range of moquettes and covers to allow customers to completely colour coordinate the entire vehicle. Carrying this out is in addition to any interior refurbishment work requested. 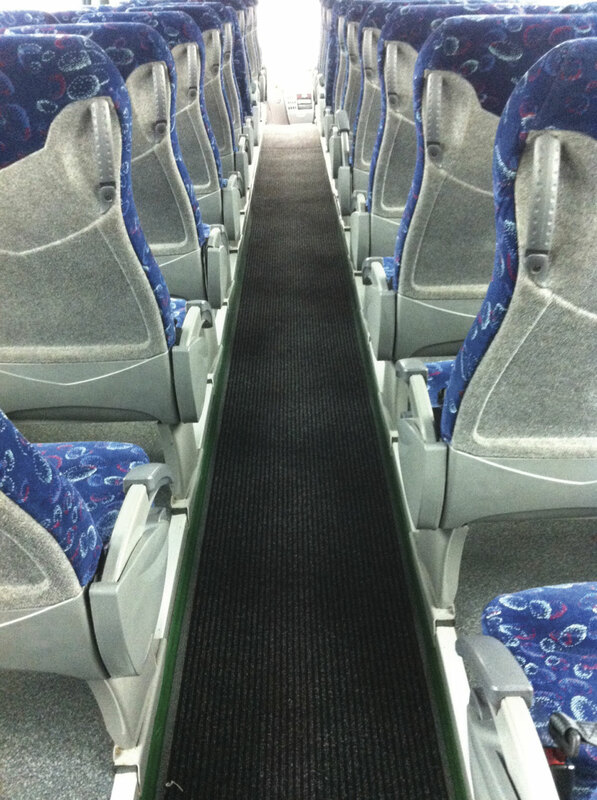 Tony Sayers of Floor Tek N Trim said one issue he faces in the refurbishment sector is the availability of moquette, saying it can be quite difficult to get hold of sometimes. Something else Tony has noticed is that seats are becoming more complex in design. In general, he believes the way newer vehicles’ interiors are put together make them even more challenging to refurbish. ‘When they designed these newer seats, they didn’t have me in mind,’ he said. A similar challenge is faced by Paul Marrows from M&H Coachworks, who is finding that recent years have brought increased competition from truck refurbishers and repairers. These truck firms are now tendering for coach paint and bodywork at cheaper prices, but he claims not to the same standard. Paintwork is something his company does a lot of for the bus and coach market, whilst a lot of operators are managing to do their own repairs in-house these days. With DDA deadlines closing in, he is doing more repairs on wheelchair ramps. M&H’s online parts shop is doing well, reports Paul, with sales coming from the website and accompanying eBay page. ‘More and more bus and coach shoppers are using eBay,’ he said. Embracing the future with e-commerce, the company has not forgotten its past with vintage vehicle refurbishment projects often being carried out. One of the biggest things Andy Lund at Meridian Coachworks has noticed in terms of refurbishment is that customer expectations are now rising. He said requests for paintwork are now taking a cue from car bodywork with increasing requests for metallic paints. ‘People are paying more attention to image these days,’ he said. Even though the company has the capabilities to do all forms of bodywork, including replacing and repairing panels, its main activity is vehicle re-sprays. Another trend Andy has noticed is for black capping of windscreens, giving the impression that the two panes appear to be a single sheet of glass. He finds it is still the case that operators are putting money into refurbishing their older vehicles rather than buying new ones. There are those who purchase new additions he notes, but he believes the trend is largely as it was when the recession hit in 2008. A lack of availability of parts is a trend noticed by Stephen Waggitt, Proprietor of Cobus. This is not just the case for vintage vehicles, but all older models, he claims. The reason behind it is the rising scrap value. Also, it is ‘extremely difficult’ to find the skilled staff to carry out bodywork and other forms of bus and coach refurbishment. He acknowledges he is fortunate to have such a skilled team behind him. The refurbishment side of Cobus’s work is ‘quite buoyant’, he said, claiming there is a big uptake in nostalgia and history. ‘Customers are going back to their roots’, he said. Paul is finding that operators are now often going for the cost efficient option of buying a second hand vehicle of three or four years old and having it refurbished to get a new lease of life out of it rather than buying new. As has been mentioned before, the lack of availability of parts means Trailways sometimes has to fabricate components in-house. Manufacturing its own components helps keep costs down for the company too. The business can repair plastics and also has a line in refurbishing and fixing vintage coaches and buses. Craig Orrell, proprietor of Read Commercials, said that at the moment cost is still something impacting his work, with many refurbishing older vehicles rather than buying new. For instance, one job he has seen a lot more of is fitting a new front to Wrightbus products. ‘When you have spent so much time and money maintaining and looking after it, it pays to keep it for longer and refurbish it,’ said Craig. Additionally, he is seeing a lot of centre door conversions on vehicles coming out of London. A company looking to do more work into the bus and coach industry is S&D Seating Systems. Founded by Dave Kirk and Sean Patton in 2006, they have between them 50 years in the transportation interior industry. Joining them is a team of experienced upholsterers, assemblers and seamstresses. 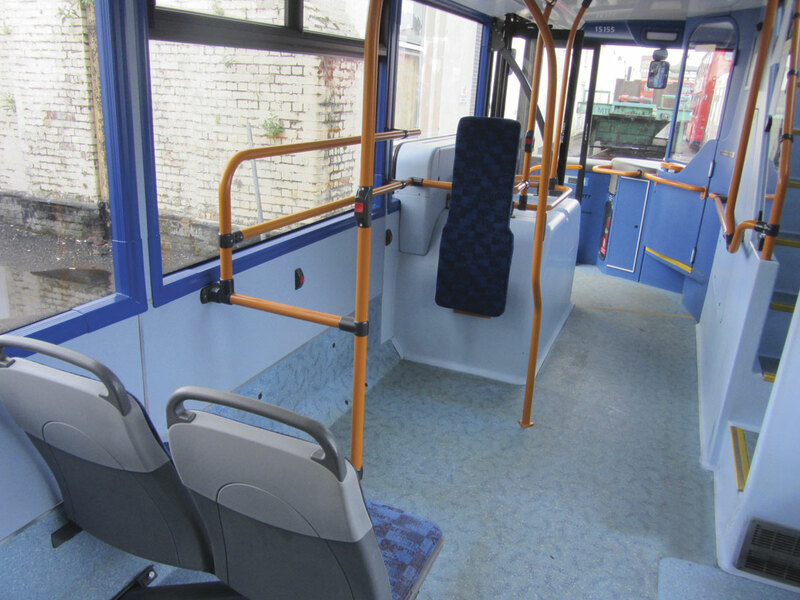 The company can carry out all commercial transport refurbishment; with a focus on ensuring vehicles stay off the roads for as short a period as possible. S&D uses moquettes and leather, with colour and design down to customer requirements and can even carry out the construction of passenger seating framework. Blackpool Coach Services has extended its floor space recently, which has allowed the company to increase its working capacity, as well as improving the work flow efficiency through the workshop and spray booth areas. It has also allowed it to add an additional smaller certified spray booth for smaller re-sprays. Despite being smaller it is still large enough to allow them to develop another line of work for ‘transporter’ type vehicles. 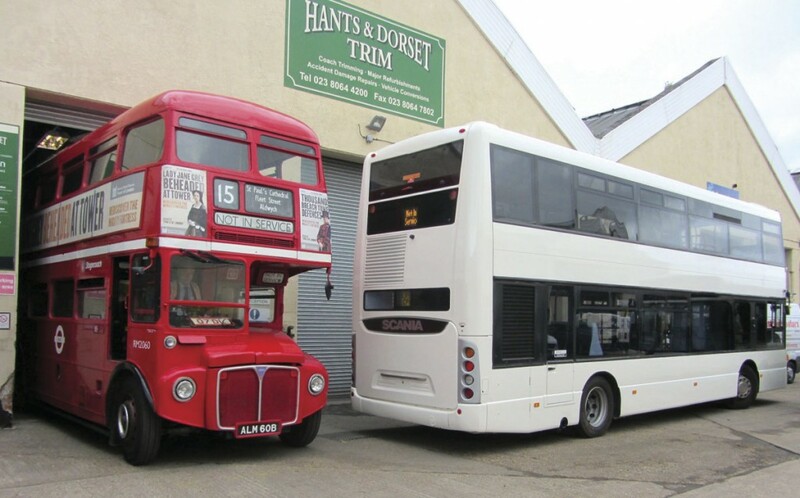 The business can take care of all bus and coach refurbishment, re-fitment and painting. Capable of carrying out coach and bus refurbishment and repainting is Enterprise Coachworks from Grays, Essex. The company’s Roy Shorter said it can do refurbishment projects, including re-fitting parts and accident damage repair. It has a 65foot spraybooth, so can take in most lengths of single deckers. With 50 years experience in the repair and refurbishment of buses and coaches, Coach and Bus World of Blackburn can carry out a vast amount of work, from quick repairs to ongoing projects. 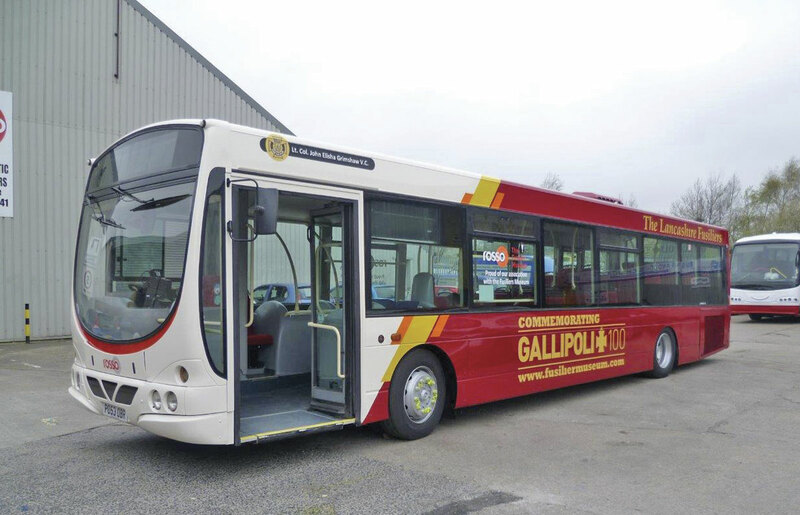 A recent notable project is the refurbishment of Rossendale Transport’s fleet of Wrighbus Volvo single deckers on the 204 service in a special commemorative livery to mark 100 years since the battle of Gallipoli. Further avenues have been explored by Express Coach Repairs. 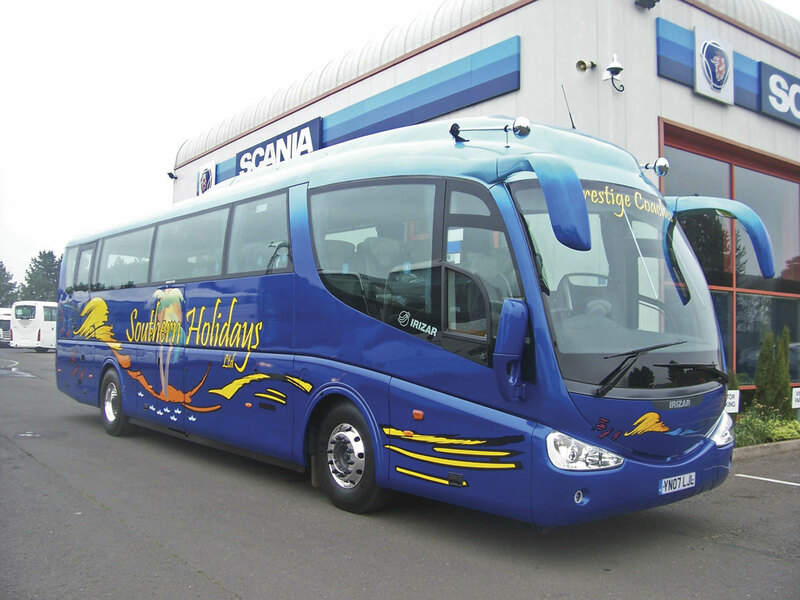 Founding its business on bus and coach refurbishment and accident repairs, the company has grown to incorporate many different assets, including a plant hire business and a trade counter selling various products to the PSV industry. Additionally, it has service vans selling consumables to local garages and workshops. However, its main focus remains on repairs and refurbishments for the bus and coach sector. High standards are something Neil Fowler, owner of Eastgate Coach Trimmers, strives for. All aspects of trimming are undertaken, from small repairs to full interiors. This includes seats, roofs, racks, side walls and the re-laying of floors, with a full collection and delivery service provided. A common job for Neil is the removal of serveries and toilets to make way for extra seats. Describing itself as the north east’s leading accident repair and refinishing centre is Thornton Brothers. It has one of the largest body shops in the region, with the five acre site featuring a 40,000square foot body shop, six commercial vehicle paint ovens, Josam laser alignment equipment, jigs and steam cleaning and shot blasting facilities. Working to fast turnaround times, it carries out accident repairs, vehicle painting and interior refurbishment. Full Circle Enterprises’ website suggests that if a vehicle has served you well, then it may well be worth leaving the trip to the dealers out and instead refurbishing it to get some more years out of it. Based at Banham near Norwich, the company can carry out panel replacement to full restoration work, and is equipped with large painting and workshop facilities. Members of the Retail Motor Industry Federation, Lawton Services, aim to achieve a high standard of work every time. Its highly trained paint sprayers know specialist techniques, finishes and effects to transform vehicles. It also has a bodyshop that can take care of a wide range of coach and bus body work and interior jobs. 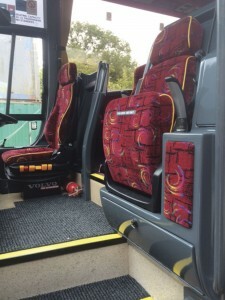 All aspects of bus and coach refurbishment are carried out by Marden Commercials. It works with many of the major companies to apply livery to vehicles and can do all bodywork, from repairing scratches to full panel replacement. Graphics can also be printed and applied to vehicles, as can vinyl wraps. Metallic and pearlescent paintwork is an area in particular that S&G Coachworks specialises in. The company provides three levels of service, with the capability to work on all types of bodywork. Certainly very busy at the moment is DB Conversions. The company carries out various refurbishment projects. A lot more interest in non-moquette material is coming from operators lately, according to Phillip Barnard from Fabercon. The recent trend for refurbishing fleets on certain routes to create a premium service means alternative interior fabrics are being specified to give it a ‘coach-like’ feel. For this, Fabercon has its Crianza leather look material. The company has had a two tone version of this specified on a fleet in Chester. Something Philip has been mentioning a lot to customers recently is Fabercon’s anti-bacterial materials. The company has products that can not only resist soiling, but also avoids stains from clothing dyes (blue jeans in particular can prove problematic). Phillip finds weight is an issue too, saying there are fabrics in his range designed to be lighter than conventional materials. For the past few years the most popular of AT Industries’ range of automotive textiles is its high flex velour, designed to be easy to fit. This roof and wall lining is made to stretch without loosing density. Another popular one is a wood effect vinyl flooring, an anti-slip product which comes in roll form. An economy vinyl flooring, Gecko, also sells well. Being 1.5mm thick, it is designed to still offer the same durability as other vinyls, but is lighter weight and more cost effective. All of its products are stocked at its Grantham site, ready to be despatched as and when required. AK Carpets has had a ‘fantastic year’, according to its Director, Richard Ayers. One product he said is doing particularly well is a suede effect lining called Persuasion. Sales for this have risen 300%. Carpets still form the core of the company’s business, but it provides a wide range of other bus and coach fabric and upholstery materials. It can cut carpets and materials to requirements, having 250 floor plans available for reference. Richard has noticed operators are replacing carpets on average every three years per vehicle. He has also noticed that we are coming out of a recession as refurbishment specialists are ordering more rolls, whereas before they were being more sparing in the amount they purchased. Proving very popular at the moment is E-Leather. Sales Manager, Carl Watkins, said the company is seeing great demand for the product. 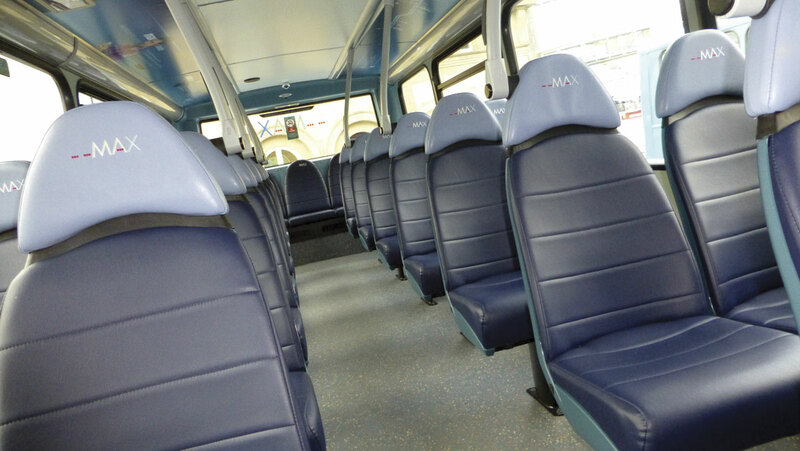 For instance, it has been specified on seats on Arriva’s Sapphire and Max premium brands being rolled out across the UK, as well as being used on FirstGroup’s refurbished vehicle. The latter operator had a colour specified especially for them, but the company already offers an extensive range of shades. What is attractive about E-Leather, said Carl, is ‘that it can make a five year old vehicle look as good as the day it went into service’. 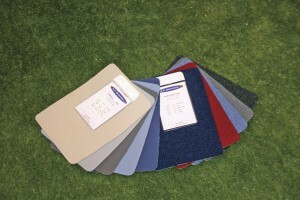 Also being used to revamp vehicles are flooring materials from Martyn Industrials. A recent project saw Brighton & Hove Buses use the company’s product on its Fringe bus moving art installation, which is a part of the operator’s ‘Get on, go somewhere’ campaign. During the installation of the flooring, the company’s Mike Houston came with his installation expert to assist and train the operator’s team in fitting the floors. Martyn Industrials has recently launched the new Lightweight Tarabus. Designed to be fuel saving, it is interchangeable with standard Tarabus. Altro Transflor’s products are designed to deliver safety and comfort, as well as compliance with the latest international regulations. Together with these practical elements, the company has focused on designs and colours. It provides a full range of accessories, including adhesives, colour co-ordinated weld rods and sealants, nosings, trims and mouldings. As well as fabrics, floorings and wallings, interior refurbishment may also require padding and seatbelts. One company that can supply this is BHI UK, specialists in bus and coach retrofit seatbelts and hand rail padding, as well as other ancillary equipment. Despite the recession being over, a significant number of operators are continuing down the route of refurbishing rather than buying new. In fact, it seems it is not a case of cost cutting anymore, refurbishment is something operators are doing as part of creating a premium service. Either way, it is all good news for the above.